Tick. Tock. SF&L 18 is coming up! During this years Stockholm Furniture Fair, BAUX will host a series of events and happenings during the week. We have gathered all the information that you need to know. BAUX will be at the Stockholm Furniture Fair for the whole week, opening on Tuesday the 6th of February up until Saturday the 10th of February. You will find us in a new location but still in the A-building, at A06:11. This time, with an even bigger and better stand than ever before! Come and see our new upcoming products and take the opportunity to speak with the founders. If you are interested in setting up a personal meeting with one of the founders, let us know by sending an email to info@baux.se. Stockholm Furniture and Light Fair, 6-10th of February (09:00-18:00). Stand A06:11. Älvsjömässan, Stockholm. We would like to celebrate the Stockholm Furniture Fair with style! What better way to do so than with oysters and champagne? Come and hang out with us on Tuesday, Wednesday and Thursday and treat yourself. All our friends are welcome, so come and listen to some great tunes from a live DJ-session and celebrate this week with all of us. Stockholm Furniture and Light Fair 6-8th of February (17:00-18:00). Stand A06:11. Älvsjömässan, Stockholm. 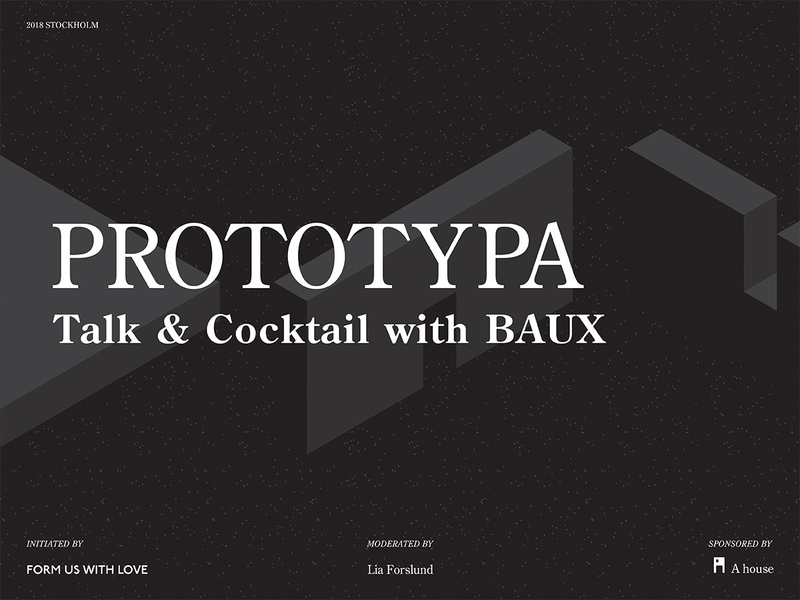 This February 7th, Form Us With Love will host a prototyping workshop about BAUX at the old architectural school in Stockholm. The evening will be filled with dialogues and workshops under the theme of prototyping. Together with the BAUX-founders and designers, we will learn about the particular challenges of prototyping and discover the ideation process that leads to a successful product. After the workshop, we will have some drinks and catch up. Remember to RSVP for this event, register here! Ahouse 7th of February (18:30-19:30), Östermalmsgatan 26a, 11426, Stockholm.